Facebook. A name that has become part of our English vocabulary. Synonymous with our everyday phrases, much as how Google and Xerox have become. Powerful enough to ensnare so many users in such a short amount of time. And the fascinating point is that it only now, this year, has finally come into fruition as a film backdrop. Starting with the interesting documentary, Catfish, just a few weeks ago, The Social Network markets itself as an origin story of sorts of Facebook and the inspiration behind its creator, Mark Zuckerberg. However, beneath all the ‘historical’ glean is a captivating narrative that encompasses raw human emotion and the life of a genius who made an accidental discovery. The Social Network is a great modern film that is powerful because of the excellent delivery and wonderful characters behind it. 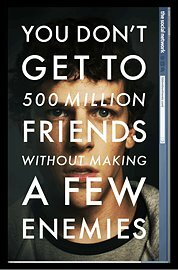 The Social Network follows Mark Zuckerberg (Jesse Eisenberg), a brilliant Harvard student yet with a brash and arrogant personality. After being dumped by his girlfriend, Mark retreats to his room and beings to blog and create a new website. This starts to set off a series of events, which leads him to the inception of Facebook. Along with the help of his friend, Eduardo (Andrew Garfield), he begins to invest and launch the website. However, soon, he runs various people that seemingly want to help him. The question for Mark becomes not only who are his enemies and friends but what his own motivation ultimately is. Two of the biggest questions that one might ponder are: how much has Director Fincher over-glorified Mark’s story and is there enough material in a four-year span, which the film takes place in, to create a compelling piece of cinema? The former is easier to answer. Some scenes do feel like they were stretched and made so extravagantly that it does take the viewer a bit out of the experience whether its characterizations or situations. Of course, perhaps these scenes are honest and are taken out of context, at least in this viewer’s eyes, because of how other films make similar, over-extravagant decisions. However, it is still something noticeable to be recorded. The second question, however, is something that, personally, is not as much of an issue although it could be understood if some feel that perhaps this film came too early: the resolution of Mark’s narrative is never really complete. Because of this, the film has to resort to a flash forward, flashback structure that sometimes struggles to keep a coherent balance, especially in the first half of the film. Yet, on the other hand, this short period is surprisingly strong in terms of its content. Fincher and his team have created a very compelling dramatic piece with some terrific balance in tempo along with smart script and delivery. Even with the short amount of time the film has to deliver its message, The Social Network truly feels intricate and large in scope with a lot at stake. The audience is initially motivated by the curious personality and motivations of Mark during his time at Harvard which then slowly becomes a want to discover the reasoning of the two simultaneous lawsuits against Zuckerberg and so on. This continues brilliantly throughout the film without seeming arbitrary thanks to some smart editing and well-paced tempo. The film is relentless in how it presents information. There is nearly always something engaging going on and rarely does it feel like the film wasted a scene with something irrelevant. It all melds well together to mesh into cohesive themes that resonate with the audience; all culminating with an ending that is so simplistic and banal in practice yet powerful because of what it represents in this journey with Zuckerberg and Facebook users in general. The other piece to this puzzle is really the writing and the actors. The script gives its scenes a lot of complexity and necessary technical jargon but never fails to lose the audience because it always returns back to really central human emotions. This is supplemented; headlined, to take it a step further, by fantastic performances. The supporting cast is, for the most part, great. A noteworthy performance here should be Garfield. Although seemingly skinny and meek at the very outset, his performance slowly balloons into several other transformations, ranging from imposing to confused to apathetic. And yet, the true star of this film that sticks in the mind long after the film is over is Eisenberg. His demeanor, speed of words, apathy, and loneliness are just a few of the emotions that drip from his performance throughout the entirety of the film. The fact that The Social Network starts with Eisenberg mumbling and speaking too quickly to his girlfriend sets the mood for what is to play out in the film. Whether or not this is really Mark Zuckerberg is not the point. In this film…in this context, Eisenberg plays one of the most interesting characters of the year and by the end, the audience never is told whether he is good or bad or in between; much like a Facebook profile, we are given a superficial look into Zuckerberg’s profile and after finally accepting his friend request and exploring his pictures, his Facebook wall, and all of his information, we then are given the choice to rate him. Yet much like with any human being…much like with any digital identity, the choice is difficult and nebulous, far long after the credits have rolled. The Social Network is a relevant and engaging biopic filled with fantastic performances and a persistent pace. At times, the film seems a bit limited by its narrow scope with some scenes seemingly overly glorified or extended, yet this is to miss the point of one of the best movies of the year. This film is far more than just about a small historical lesson about the creation of Facebook. The filmmakers have smartly woven in a smart and modern narrative that gives some of the technical banter and drawn-out lawsuits a place with one of the most interesting characters of the year, Mark Zuckerberg, in the central role. This is probably also due to one of the most surprising performances of the year as well, Jesse Eisenberg. A tapestry of human drama, tragedy, betrayal, and genius makes The Social Network a film that will be remembered not only because of its association with one of the early 21st century’s digital booms but a powerful and well-told narrative that reflects the current landscape of our humanity in the digital age.